A few quick, barely researched, and not so – what is it that Buck always says? And that pretty much sums up the way that root canal in Orlando felt on Saturday. The Rocket. Yep, I’m sticking my neck out and nicknaming Mike Davis. Has to be done. And not because of his 168 yard, three touchdown performance on Saturday. A performance where he basically took the team on his shoulders (well, thighs, I guess) and willed us to victory. No, that’s not the reason for his new moniker. Instead, his new name arose thusly. The king is dead, long live the king. I suspect we’ve seen the last of Connor Shaw as our starting quarterback. I know he’s a tough kid, and I wholeheartedly agree with the assessment Brian Griese made on air Saturday: Shaw is the better quarterback. But I also know that a bad sprain to your throwing shoulder might take more than two or three weeks to heal. I also noticed that the two or three weeks time frame came to the coach from Shaw, and not from the training staff. Hope I’m wrong, ‘cause I’m #teamglove all the way, but I think we are probably seeing the beginning of the Thompson Era. Where’s the gas pedal? One of the hallmarks of Steve Spurrier’s teams at Florida was their ability to work an opponent silly. When the OBC got up on someone, he didn’t just win, he DOMINATED. Went right for the throat and did the funky chicken on it. 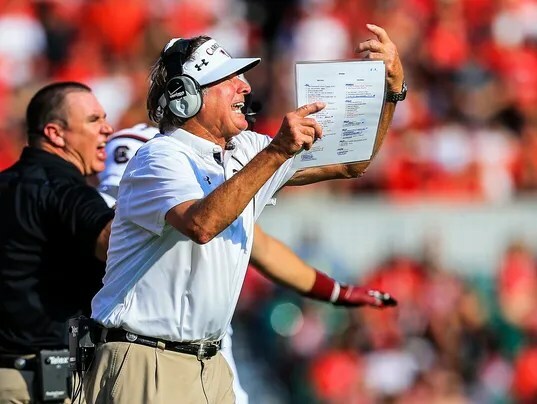 One of the hallmarks of Steve’s Spurrier’s teams at South Carolina is an inability to put another team away. From the HBC’s very first game at Carolina (a 24-3 third quarter lead at home became a 24-15 escape) to his most recent (a 28-10 fourth quarter lead on the road becomes a 28-25 squeaker) the trend has persisted. What’s the reason? No idea. But I do keep thinking of something Sweet Old Lou said: The prevent defense only prevents one thing: winning. Those soft zones, coupled with an inability to tackle led directly to both of the Knights’ fourth quarter scores. Speaking of the defense. I know they are young. And I know Whammy is a great recruiter. And I also like the guy. But we have the most dominant player in the nation on defense, and yet we can’t seem to get him freed up to make plays. I’m going to leave it at that, because I don’t want to be the first person to head down that particular road. But we all know where that road is going, and I’m afraid it’s gonna become a busy street soon. On a related note: Just how good are we? Are we the #12 team in the country? Are we BCS Bowl caliber? I’m not so sure. Our best win thus far is probably the 35-25 win over Vandy at home, and that isn’t saying much. Kentucky should make us feel better about ourselves this weekend, but this team is going to have to get better play from the defensive second and third level if we are going to survive the three game road trip that follows. Ah geeze, I didn’t even mention our terrible special teams . . . The Clemson faithful were at me again at work. They are so pumped to be the #3 team in the nation and one guy presented me with his estimation that they will play Oregon in the NC game. He predicts that Clemson will be undefeated coming to Columbia and will easily win agains the soft Gamecocks defense. He pointed out that while South Carolina struggled to put away Central Florida, Clemson rolled over Wake Forest. I pointed out that Clemson was at home while SC was on the road but this made no difference. I only point this out because I fear that we may lose a few games until Nov. 30. I fear we could lose to Arkansas (on the road), Florida (though here I do feel better), Missouri (away), and maybe Tennessee. I know I am a doubter but we simply are not playing well.